A Democratic candidate is injecting Donald Trump and his call for a Muslim ban into a New Hampshire Congressional race. Carol Shea-Porter issued statements Tuesday calling on her two Republican opponents to denounce Trump's proposal to ban Muslims from entering the U.S. as she seeks to win back the 1st District Congressional seat she lost in the 2014 election. Shea-Porter called on incumbent Frank Guinta to return a $1,000 donation Trump reportedly made to his re-election campaign. She also issued a second statement challenging Dan Innis to denounce Trump's "deeply offensive" statements. 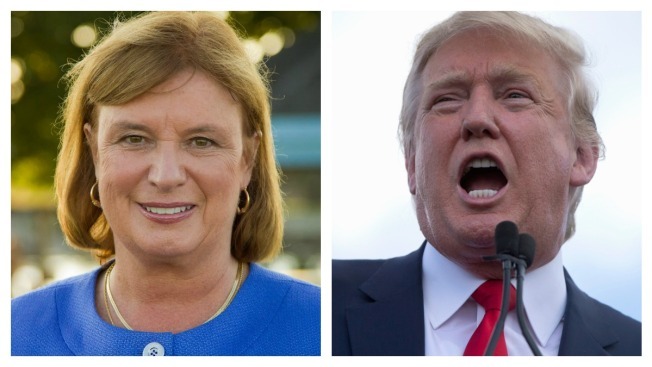 "Dan Innis must join NHGOP Chair Jennifer Horn and denounce Donald Trump's hateful, un-American remarks," she said. "Trump's remarks not only divide our country, but also put our homeland security at risk and play right into the hands of radical extremists." Trump Calls for 'Complete Shutdown' on Muslims Entering U.S.
Horn had issued a statement on Monday criticizing Trump's statements about banning Muslims. "There are some issues that transcend politics," she said. "While my position is certainly political, I am an American first. There should never be a day in the United States of America when people are excluded based solely on their race or religion. It is un-Republican. It is unconstitutional. And it is un-American." Some supporters of Trump in New Hampshire have called on Horn to step down based on this and other statements she has made about the Republican presidential contender. Gov. Baker: Trump's Call to Bar Muslims From US "Ridiculous"
Trump's call Monday for a "total and complete shutdown of Muslims entering the United States" was the latest salvo for a party aggressively testing the boundaries between concerns about security and discrimination against a religious group. Most of Trump's rivals in the 2016 race, as well as numerous other Republicans, said Monday's announcement was the proposal that finally crossed that line.